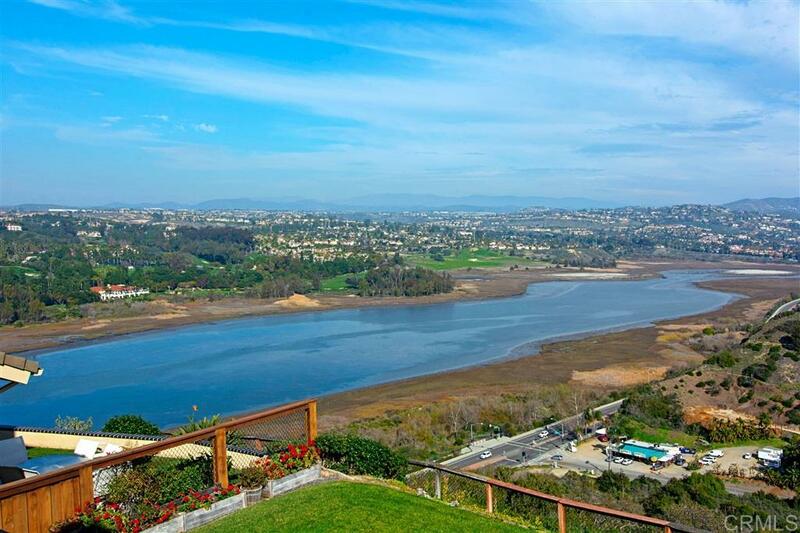 Panoramic views of lagoon, golf course & mountains, plus ocean view and breezes in front of home. MASTER BEDROOM DOWN!!!! Located in exclusive, gated Monte Mira with only 33 homes. Views from almost every room. Newly updated kitchen (counters, appliances, faucet) and bathrooms, paint inside & out & carpet. Lg. bedroom upstairs with ocean view could be 2nd Master. Fireplaces in LR, FR & Master bedroom. French door of Master to patio with more views. 1 mile to beach. Close to Aviara GC, Forum. On cul de sac, Stunning views, close to EVERYTHING. Gutters replaced 2006, copper piping throughout 2007, Wood floors, 2012, Remodeled master bath & powder room 2017, Central A/C replaced 2015. Impeccable house set high on a hill, on a cul de sac with views out almost every room. List of improvements in documents. Enjoy living close to the beach, no neighbors behind, views everywhere and close to shopping, restaurants & golf. Watch the sunset AND sunrise from this view home.